Recycling is a great practice at home, but it reaches far beyond taking materials out of the waste stream. Tomorrow, November 15th, is designated as America Recycles Day, so today’s Wetland Wednesday is hopeful about the future of sustainability. Recycling is not a perfect alternative to single-use plastics, and there are other ways to reduce our consumption of resources. For example, mitigating loss of byproducts by finding new and inventive applications can greatly reduce consequences. Large-scale food manufacturing leaves plenty of byproduct as leftover plant material that can be used as livestock feed, potentially as biofuels, or fertilizer. In the meat industry, byproducts are often further processed and commercialized to maximize the use of all parts of animals. CWPPRA and our partners have changed some practices in recent years to be more efficient when using resources, for example beneficial use of dredged material (yes, we recycled our header image). Mandatory dredging of shipping and navigational channels produces a bounty of sediment that was lost in the past, but we can now use that material in restoration projects. This exciting new practice has already been implemented in a few CWPPRA projects to restore marshland and nourish pre-existing wetlands. Our coast faces many human-caused threats, and its future depends, in part, on practices becoming more sustainable. By using new technologies to better use resources, CWPPRA hopes that Louisiana’s natural splendor and resilience can continue to benefit future generations. What better way to spend a Friday afternoon than with jambalaya, Cajun music, and conservation? That is how the CWPPRA outreach team and many other organizations spent last Friday, April 20th, at the UL-Lafayette Fête de la Terre Expo. The expo showcased many wonderful local groups including, but not limited to, the Citizens’ Climate Lobby, the TECHE Project, and the Bayou Vermilion District, all hosted by the ULL Office of Sustainability. Students visiting the expo could learn about how long it takes for different types of litter to decompose naturally, how solar panels are used to generate power, and whether or not to recycle different waste products. During their visit, they could grab free jambalaya, listen to the Cajun jam session, or decorate their very own reusable grocery bag. There are so many resources that help our community celebrate conservation, and the expo was a beautiful day for getting ULL students and faculty involved, interested, and informed. An urban delta may be defined as a city home to as many as half a billion people living and working in a deltaic zone where rivers meet the ocean. These communities are coastal, riparian, & urban which are threatened by increasingly strong typhoons, hurricanes, uneven rainfall patterns with droughts . According to New America, the 3 major global trends are climate change, rural to urban migration, and urban economic concentration. The Delta Coalition is the world’s first international coalition of governments joining forces to share knowledge, innovation and sustainability practices to create more resilient urban deltas . Policy makers, politicians, NGOs, academics, engineers, designers and consultants worked and talked together about the challenges and opportunities of the world’s urban deltas at a Sustainable Urban Deltas conference in 2016 . Deltaic countries who have joined The Delta Coalition include: Bangladesh, Colombia, Egypt, France, Indonesia, Japan, Korea, Mozambique, Myanmar, the Netherlands, the Philippines, and Vietnam . Other organizations moving forward toward sustainable urban deltas are PRIVA, and Sustainable Urban Delta where waste water recycling, or creating bio-fuel from food waste are examples of sustainable innovations for urban deltas . By one count, over 1/4 of the world’s 136 largest port cities occupy deltaic formations  and the percentage of people living in urban areas “has grown from 34% in 1960 to a projected 66% in 2050” . Urbanization is directly related to economic growth, creating more jobs, and increasing population; though this steadfast increase is positive in some ways, it also increases the chance of poor governmental preparedness resulting in poor living conditions, quality of life, and slums . “It is clear we can only solve the world’s environmental problems if we solve the problems of our cities first” . — According to Chief Curator of IABR ( International Architecture Biennale Rotterdam), world leaders must invest in learning the capacity of cities, experiment, and join networks while creating new and positive urban visualizations towards a productive, clean and socially inclusive city . In regards to Louisiana’s urban delta, CPRA developed Louisiana’s Comprehensive Master Plan for a Sustainable Coast to incorporate coastal wetland protection and restoration for coastal and deltaic communities, and CWPPRA projects are consistent with the Master Plan. northshore marshes are to be sustained. Project goals include restoring and nourishing marsh. expedite colonization and enhance stabilization. This project is on Priority Project List (PPL) 25. World Soil Day was officially celebrated on December 5th. This day was created in an effort to share the importance of healthy soil and advocate for the sustainable management of soil resources. Wetland soils, also known as hydric soils, are permanently or seasonally saturated by water and develop anaerobic conditions. Soils’ ability to store surface or ground water and bio-geochemical processes are critical to wetland function and maintaining a healthy ecosystem. Wetland scientists spend a great deal of their time performing soil surveys. Different wetland types feature different soil types. Soils should be evaluated for the presence of pesticides or dangerous elements that could cause damage to the vegetation and animals of that wetland site. This day was created in an effort to focus on the importance of soil as a critical component of natural systems and as a vital contributor to human well-being. 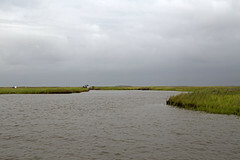 associated with the Calcasieu Ship Channel and the GIWW. Hurricane Rita and again, more recently, by Hurricane Ike. and west of Gibbstown Bridge and Highway 27. This project is on Project Priority List (PPL) 18. Keep up with this project and other CWPPRA projects on the project page.